Attics are like vacation homes for many species of critters in Maine, such as bats and flying squirrels. Unfortunately, it's hard to get these critters to be potty trained. Midcoast Wildlife Specialists have encountered many homes that have accumulated animal waste and urine soaked into the insulation. The odors in the attic are obvious, but the smell will permeate into living spaces as well, which is a big problem. Our company can handle any wildlife situation that is present, and resolving hazards being caused by the critters, including guano being contained in the house causing unsafe living conditions. We will remove the waste and guano followed by sanitizing your attic. Insulation that has been contaminated by wildlife droppings should also be remediated, which often times will mean the entire attic needs to be cleaned out. We do it all. From removing the critters to repairing damage, our services are the best. 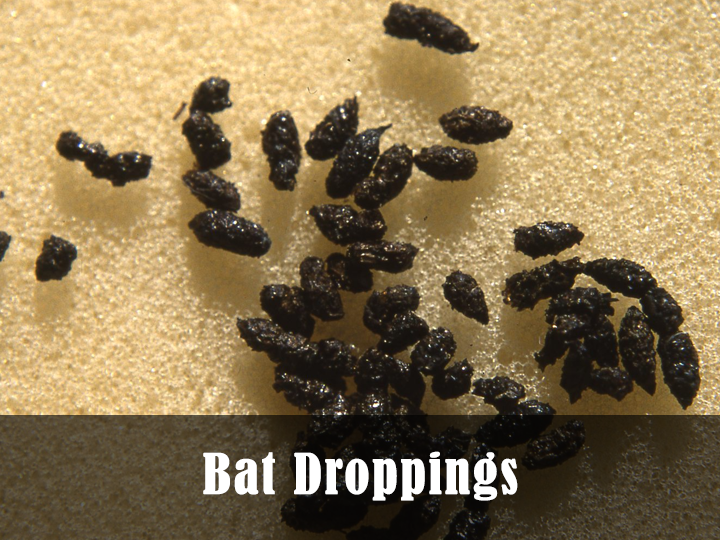 Bat guano/droppings will leave a musty odor, which can be worsened by warmer weather conditions. Bats and have the habit of urinating and shedding their pellets in the middle section of the attic, which is a typical spot for their roosting area. Bat guano will also be scattered throughout the attic, but it will mostly be accumulated above the established roosting area in the attic. Raccoons are another animal that will take up residence in your attic. Raccoons are particularly damaging to an attic. They will compact the insulation by burrowing through to a point the insulation’s R-value is greatly diminished, which result in much higher utility bills for the heating & cooling of your home. There are human disease vectors associated with the waste from raccoons, so the attic must be restored properly. Not only do we clean your attic, but we must first exclude or trap the offending pests that have taken up residence in your home. Once that step is completed, we can proceed with removing the guano by performing a process know as attic restoration. Insulation companies do not offer this service, because they only install insulation. Wildlife companies & Biohazard companies are the only two industries in Maine that specialize in attic restoration and critter droppings cleanup. You will pay a Biohazard company 10X what you pay us for the same service, because their job is to stress the diseases associated to offer you services that aren’t even necessary. Midcoast Wildlife Specialists will only offer you repairs that are needed. We do not use scare tactics of disease to incline our clients to move forward with our services. Although, it is a good idea to keep an open mind to what is possible when considering the overall health and safety of your family & yourself. 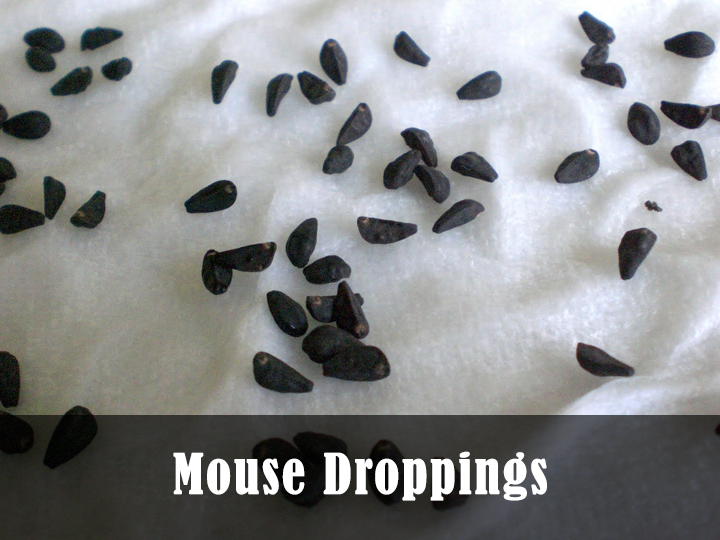 Mouse droppings ranges in size from 3/16 to ¼ inch long -- similar to a grain of rice, with pointed ends and color varying from blackish brown to gray depending on how old it is and the diet of the mouse. Fresh droppings are black, turning brown over the next week, and changing to grey over time. If a rodent has consumed pesticide from a bait station, the droppings may be the same color as the bait. Older rodent droppings will crumble upon contact, while fresh droppings will be soft and malleable (never touch droppings with your bare hands). Squirrel droppings are cylindrical or rounded, up to 8mm in diameter, generally deposited at random but can accumulate at favored feeding site, such as a bird table. 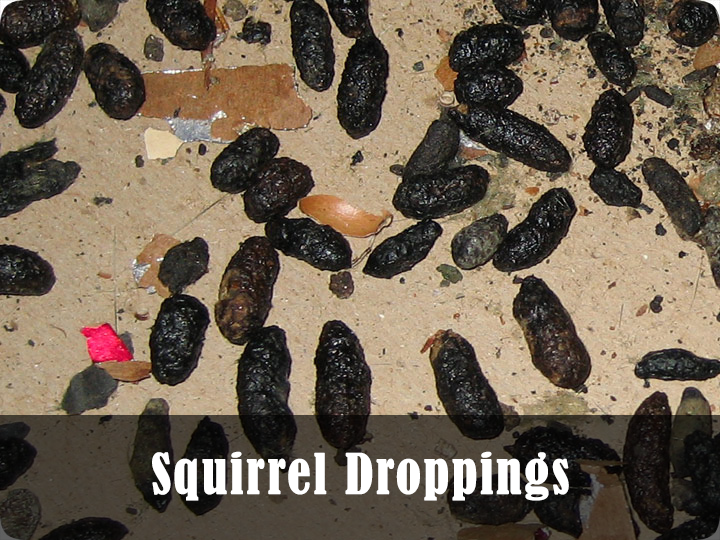 Squirrel droppings usually have softer, more circular sides. Squirrel droppings usually appear in clusters in certain spots. It's not common to see squirrel droppings all over the place -- they are, for the most part, much more discreet. Will My Homeowners Insurance Pay For All This? Many homeowners policy's will cover the cleanup of bat waste and damaged insulation. Most insurance policies will have a rodent exclusion clause. Meaning they will not cover damages caused by mice, squirrels, or flying squirrels. However, we do many jobs through insurance specifically for bats & raccoons. Before I Call Insurance, What Do I Need To Know? Do your research before contacting insurance. They will think of everything they can in order to not cover your claim, because that is just the nature of insurance. Bats are not rodents, they are mammals, and as such do not fall under their rodent exclusion clause, as we have heard other insurance companies trying to claim. It is also advisable to use the terminology of “damage” rather than “droppings" or “guano." What Are The Advantages Of Having An Attic Restoration? There are both immediate and long term benefits of attic restoration. In the short term, odors will no longer pose an issue, in most cases. The home is healthier as a whole by not having contaminated insulation and harboring pathogens. Fresh, high-grade insulation will make the house cooler in the summer and warmer in the winter, and on larger homes will substantially reduce the cost of utilities. If I Want To Sell My Home, Is This Absolutely Necessary? Most prospective home buyers will want a home inspection done prior to purchasing a property. It is then where the animal waste may be discovered by the home inspector and become a point of contention on the sale of your home. Attic restoration will increase the value and desirability of a home, because it’s no longer a concern from the buyers perspective to associate additional costs with buying the house. Selling the house without disclosing a major repair cost, such as attic restoration, can potentially result in a lawsuit and more money lost, rather than just being honest or getting the issue resolved in the first place.